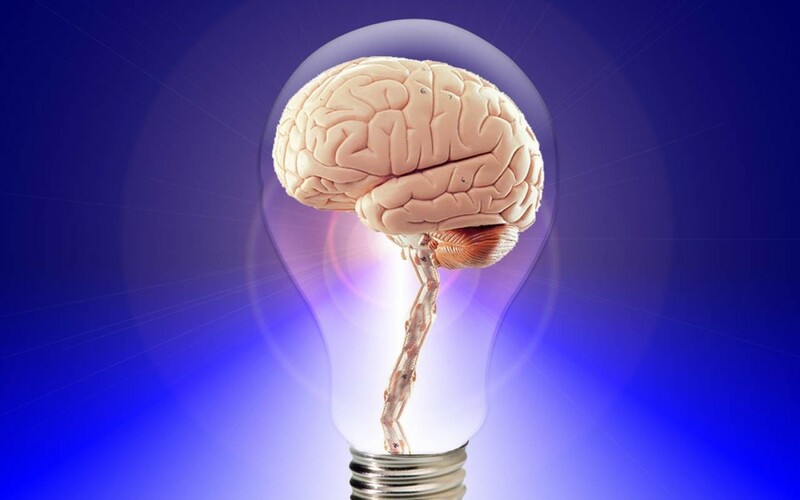 Do great marketing collateral ideas just come from your creative brain? Or is there a smarter way to generate material for your sales team? 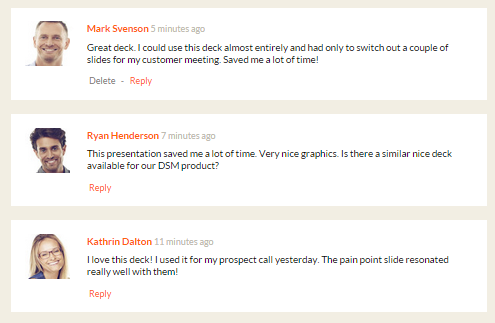 In our last post we explored how to know exactly which marketing collateral your sales team likes. This depends on bringing your marketing and sales teams together on the same platform where collateral can be shared, rated, and discussed. But once you have this knowledge pool, what do you do with the data? Marketers are all about creativity. But let’s face it, if your collateral isn’t being used it doesn’t matter how wonderful it is. Let’s say you produce 10 pieces of material. How do you know which of these your sales team finds effective to help them reach their quotas? You could go around interviewing each sales rep, but who has the time? When all your collateral is accessed from one place, however, your sales team automatically registers data when a particular piece is downloaded. That information alone gives you a ranking system. As you can see, by ranking the marketing collateral in the order of what has been viewed the most, you get real insights of what your sales people actually use. In this example, the sales presentation is the most frequently used collateral with 381 views, and it has received 30% of all views, followed by the infographic with 227 views, and so on. Now you have the best ranking marketing collateral ideas at your fingertips. There’s no need to go hunting down your sales reps to ask them what they like. Plus, you don’t have to spend time processing data since it’s all done automatically. The 80-20 rule, also known as the “Law of the Vital Few” comes in very handy for your marketing collateral analysis. This rule of thumb states that most of the results in any situation are determined by a small number of causes. 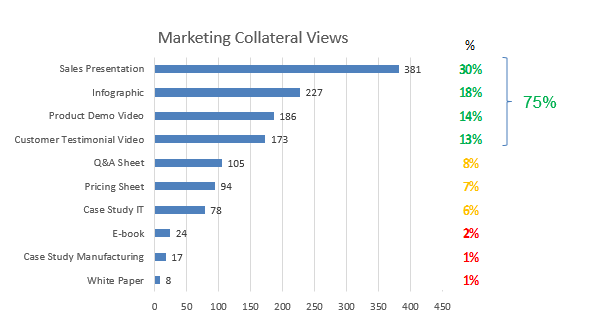 In our usage analysis example above, we see that the top 4 collaterals received 75% of all views. This is huge in terms of knowing what sales people really using. The least used collateral in our example is the White Paper with only 8 views or 1% of total views. Similarly, the manufacturing case study and the e-book were used very infrequently. You might be surprised and even disappointed that the White Paper, which is 22 pages long and required a lot of effort, saw so little use. You might feel the same about the manufacturing case study and the e-book. Now, let’s see if we can find out why the sales deck was used so much and the White Paper so little. As you might remember from our previous blog, you can provide your sales team with the opportunity to make comments and suggestions. (Important: the repository you use such as www.Hummingbirdshare.com needs to have this feature). Whew! You might think that you spent 6 weeks on creating it, spent money with an agency and now this? Well, take it this way: At least you know that this type of piece is not needed, and you can spend your resources on collateral your sales reps really want. If you add the ability for sales reps to comment on collateral, you get valuable qualitative data and maybe even ideas for future sales pieces. Even better, you know exactly who provided the feedback, when it was provided and you can contact them for more information and clarification. Again, the key to success is having this all on a user friendly platform where feedback and ideas flourish naturally. As you collect the data, you’ll realize you have incredibly valuable information. The most effective material will quickly find its way to the top of the list. Knowing what kinds of collateral are working for your sales team allows you to focus on producing more of the same. This removes the guesswork in marketing campaigns which reduces your resource drain. Your marketing team’s creative energy focuses on actionable data. Instead of using a shotgun approach, efforts are much more focused and precise. Another great advantage to the shared marketing collateral silo is that new hires are updated much more quickly. On the marketing side, they can see at a glance what type of collateral is preferred. On the sales side, they see what works to boost sales. Maybe you think you have to make a big investment to produce this kind of sharing platform, but these SaaS platforms already exist. They require a minimal investment of time and money, but the ROI can be huge. Leverage marketing and sales team knowledge with a simple SaaS solution. Contact us today.